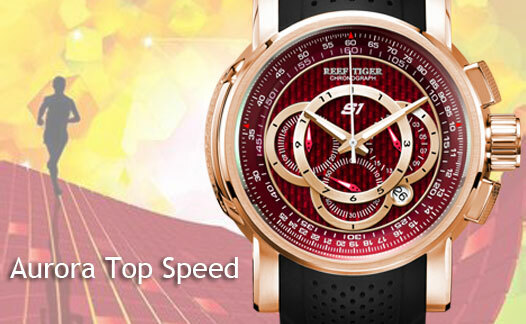 Reef Tiger Aurora Top Speed watch is one kind of racing car wristwatch in a real sense from its material, design and functions. 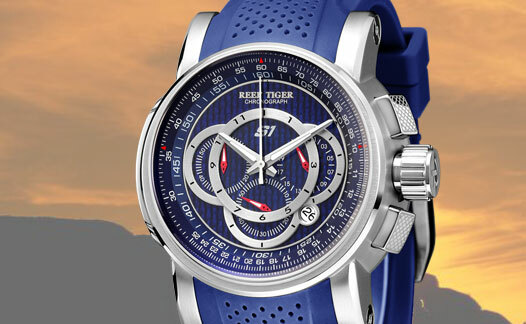 Its ergonomic case, racing style design, natural rubber strap and the practicability of RT685 Quartz with chronograph movement make this kind of watch can be rated as a completed navigating instrument. 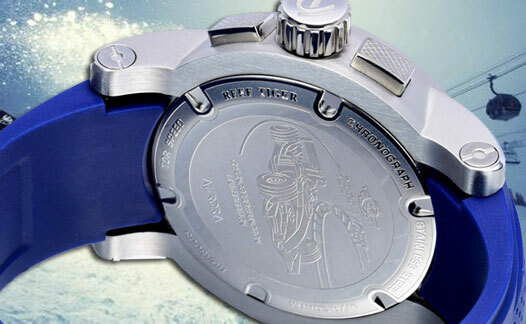 Design of the watch refers to ergonomic. It is worn more comfortable with the great watch dial in 48.5mm. Second hands, pointers on the sub dials and the date circle all are designed in red. It is a strong contrast to white and black watch dial. 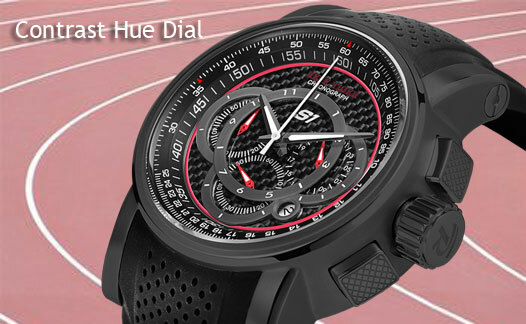 In addition, it also uses a carbon fiber dial. Sword-shaped time scale design looks like the brake disc on the racing car, and it is filled the luminous material so as to be read clearly even in dark. The car dashboard as a logo on the hour adjustment button, and chronograph button is decorated with tyre pattern. It makes the corner angle is very clear and the watch looks quite dynamic. It is adopted old style with Italian imported calfskin, with the folding clasp. Scrub surface likes seat style of the classic car. The design of the both sides groove is similar to the double tops design of the car. Case back is engraved rally crash pattern by laser, which is to emphasize the brand line and make racing style more intense.